I was looking for a light, neutral Paint Pot when I walked into MAC. I wanted something that could neutralize the lid shade a little while intensifying metallic eye shadows. This shade would need to have a pearl finish, be glitter-free, tacky enough to grab powders, but not so creamy that it creases. In fact, I knew a Paint Pot would work, but when I swatched the only pale shade available - Painterly - on the back of my hand, it looked muddy, flat, uneven, and all in all, like too much of the wrong shade of concealer. Then stacked helter-skelter on a little unglamourous tray, without even a rack to call their own, were what looked like cream color bases embossed with metal stripes (the stripes are less "regular" and more like filed metal than the publicity image above, but I digress). 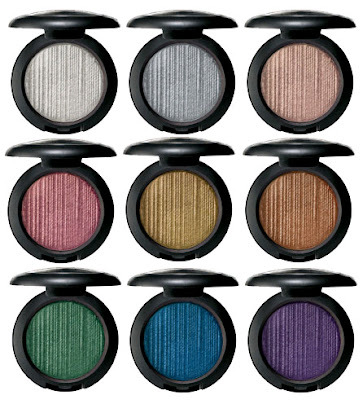 These were the new Metal-X Cream Shadows for the Winter 2011 season. Now I'd heard about the Metal-X collection some time ago, but pretty much all of them were horror stories about how hard and poorly-pigmented they were, and how they creased on the lid. Are the new ones reformulated or the same as the not-so-popular originals? Well, as shadows, I don't have that much to say about them other than that I've never had any intention of buying a Paint Pot or Metal-X Shadow to wear solo on the lids since they don't give the sort of color pay off and consistency that I want. I was looking for a good pearlized base in a generous size. And these are it. The texture is harder than a Cream Color Base, and more long-lasting on the lids. They don't set like Paint Pots and they aren't as pigmented, but then they blend out more evenly and have a slightly silkier texture. They do crease, so you've been warned. Not as bad as Cream Color Bases, but they still crease slightly. If you want something budge-proof because you're not wearing shadow over it, then you need something that sets, like a Paint Pot. There were a few colors I liked, but since I was specifically looking for a perfect base, I picked Palladium, a metallic champagne-ash without any glittery particles. It's the perfect cross between beige and silver, so it works with both cool and warm eye shadow shades without muddying them. I tested it on several colors while I was in the store; Club shadow, Blue Storm pigment, Sumptuous Olive shadow, etc, and all of them not only rubbed on really intense, but also stayed true to tone. MAC Metal X Cream Shadow swatched on the finger. 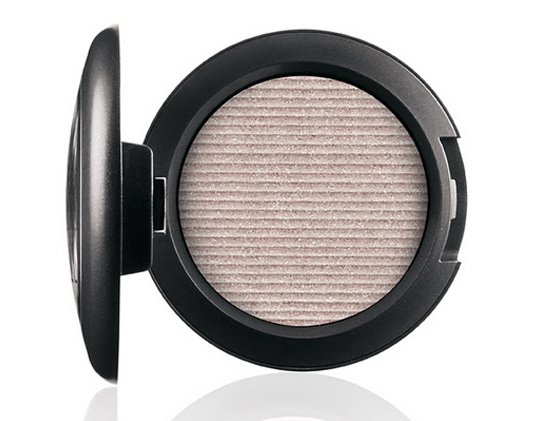 If you've ever bought a pigment or shadow and wished it looked on your lids the way it looked in the container, then get this neutral champagne-ash Cream Shadow as a base. MAC Blue Brown pigment - people either love or hate this shade because it's so beautiful in the tub (dark wine-brown with turquoise sheen, but can rub out to a red, bruise-like shade on the lids). Tokidoki Stella shadow - enough said about this one... I'm not a fan of ANY of their eye shadows because the formulation is cheap and everything just falls right off your skin. Swatch test: MAC Blue Brown pigment and Tokidoki Stella, solo on the left, worn over Palladium on right. On its own, it's pretty, but maybe a tad too light to be worn solo on the lids unless you're just going for a lighten silvery gleam (like you are wearing gloss on your lids). All in all, I wouldn't say rush out to get these shadows as the shades are just ok. 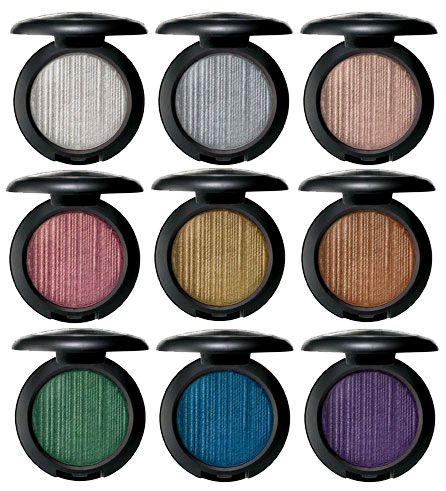 The pigmentation is sheer, and I prefer my shadows to be much stronger or highly buildable. But if you want a good eye shadow base, I highly suggest checking these out, as I don't always like how dry Paint Pots get, or how slippery Cream Color Bases can be, but these are nicely in-between. that looks like a nice shade! @TzeYien: Yes it is! Nice blend between silver and gold, but it's quite sheer so I won't be wearing it as an eye shadow by itself. Eh, i'm not a fan of the low pigmentation. I'm not patient enough to build.